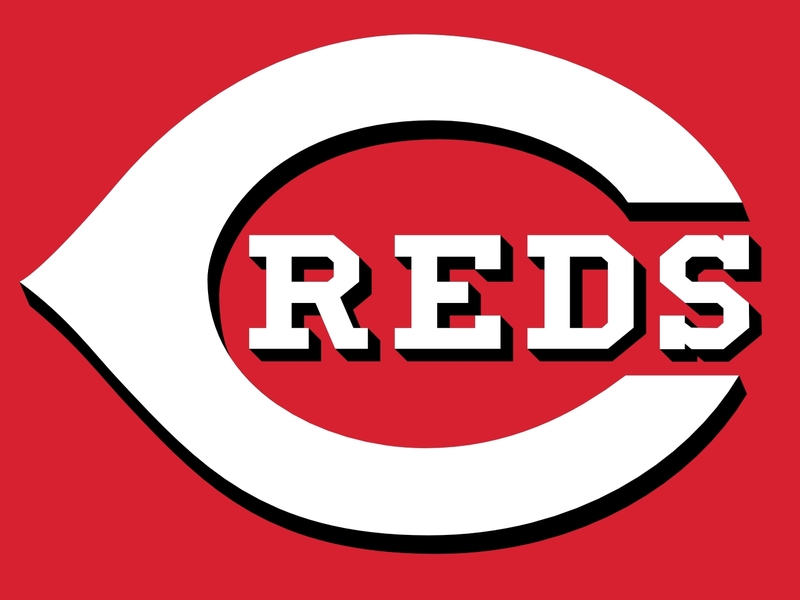 The Cincinnati Reds are trying to make a push for a division title again in 2013 . but injuries have plagued them the entire season. Getting players healthy is going to be a huge factor if they expect to win the division and go deep into the playoffs. The major piece missing is Left Fielder Ryan Ludwick as he has been out since Opening Day with a shoulder injury. The other huge piece that has been missing for much of the season has been . He has been on the shelf three different times with a lagging right lat strain. The Reds look to have him back in late August. The last and final piece that needs to get healthy is the bullpen. Guys have been filling in great but that won’t last forever. Look for Sean Marshall and Jonathon Broxton to come back and help through the rest of the season and the playoffs. 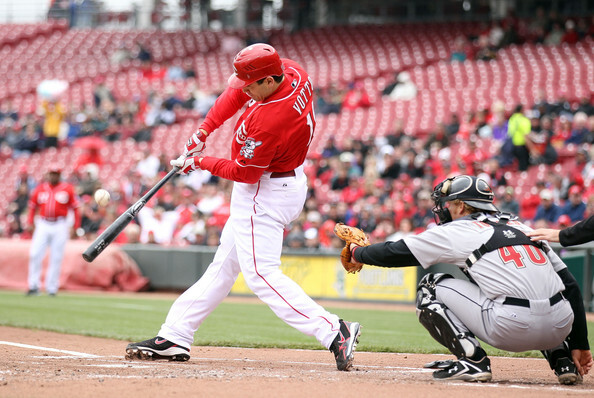 The Cincinnati Reds are five games back of the Cardinals going into play on Thursday. They won the first two of their series after the ALL-Star Break, taking two of three from the Pittsburgh Pirates and three of four from the San Francisco Giants. But then lost three of four against the Dodgers in LA. The Reds are playing a three game series with the Padres now and need a sweep going into the weekend with St. Louis coming to town. On Opening Day 2013, when Reds left fielder Ryan Ludwick went down with a shoulder injury, it was a rather sinking feeling. After having overall good luck with health last season, it was clear that the Reds weren’t going to have quite that luck this season. 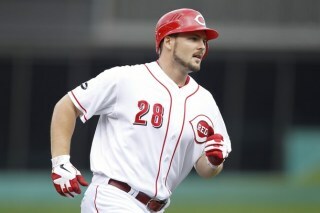 Then the bigger questions arose, will Chris Heisey finally prove he can play everyday, and how long will Ludwick be out? Unfortunately, the bad luck didn’t stop there. Chris Heisey, after 17 starts (in 23 appearances) in Left Field, ended up on the DL at the end of April with a right hamstring injury. Although his batting average was a measly .173, his defense was solid, 37 Put Outs in 38 Chances, and 0 errors. He looked to be close to returning a couple of weeks ago, before re-aggravating the injury on a rehab assignment at AA Pensacola. Bridging The Gap Or Fixing A Leake? Chris Heisey has struggled at the plate this season, only batting .173 in 23 games. Now with a hamstring injury, he is on the Disabled List He along with Xavier Paul have been filling the void left by Ryan Ludwick when he went to the DL after being injured on opening day. Sometimes injuries can cripple a team and other times it can give players an opportunity. With Ryan Ludwick on the DL, Chris Heisey and Xavier Paul have been holding down the fort in Left Field. At the plate, Heisey is hitting .173, with 20 Ks in 23 games, and now finds himself with an injured hamstring. In 20 games, Xavier Paul is hitting .297 with 10 Ks. On the mound, the Reds haven’t missed a beat with Johnny Cueto on the DL. Tony Cingrani, the 23 year old lefty, has stepped up, which will make the Reds decision even more difficult in when Cueto is ready to return. So far this season, Mike Leake has a 4.34 ERA, and a 1-1 record. In 5 Game Starts, he’s gone 6 Innings twice, Seven Innings twice, with his last outing being his shortest, 3 Innings. He’s given up Earned Run totals of 4, 5, 0, 2, and 3 respectively. He’s given up 3 HRs so far this season. Leake is in his 4th season with the Reds, and has won 8, 12, and 8 games in his first 3 season respectively. Those numbers are perfectly fine for any 5th starter in baseball. 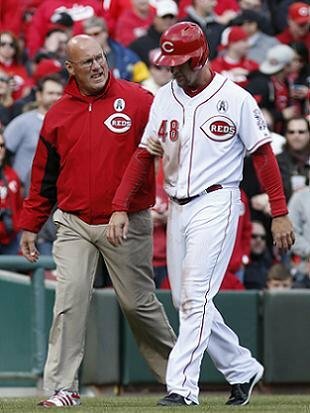 Reds left fielder Ryan Ludwick had to be taken off the field on Opening Day by trainer Paul Lessard due to a shoulder injury. He slid head first into Third Base and dislocated his right shoulder, tearing cartilage. 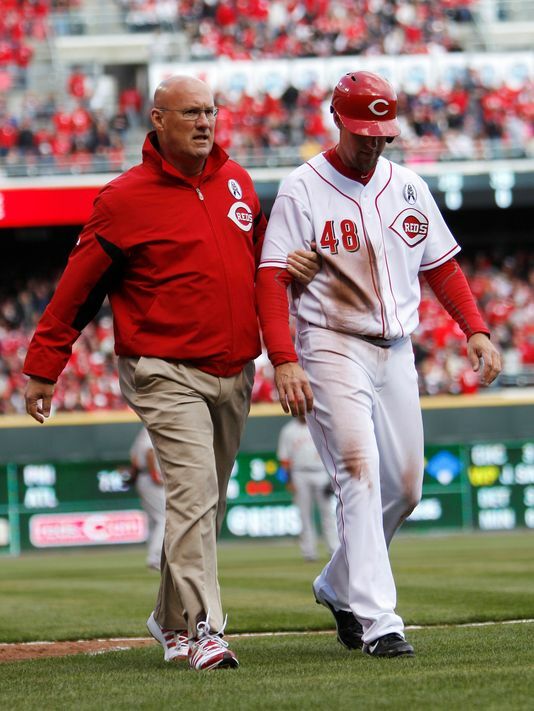 The Reds will be without Ludwick for the next three months. Without his offensive production will the Reds stay atop of the National League Central. The OF hit for a 3 Slash Line .275/.346/.877 – with 26 HRs and 80 RBI in just 422 At-Bats in 2012. Ludwick signed a 2 YR deal with the Reds worth $15 MIL over the winter. 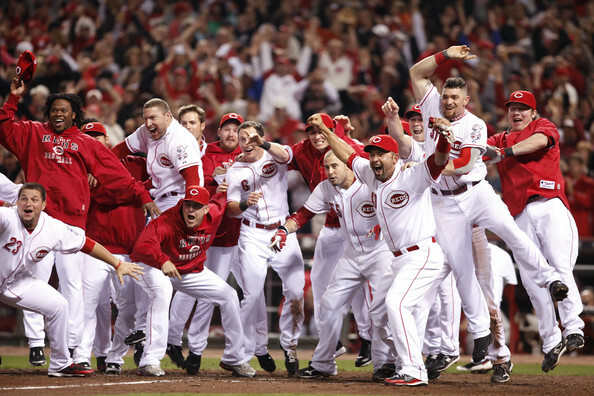 The Reds are off to a hot start with a 5-2 record with wins over the Angels, Nationals, and Cardinals. Those are big wins to start out because on paper all three of those teams should make the playoffs. It just so happened that on Opening Day against the Angels that the Reds left fielder, Ryan Ludwick, had to leave the game due to an injury. When the injury occurred it didn’t look to serious, but when the x-rays were taken it showed that he had dislocated his shoulder. Along with the dislocated shoulder Ludwick had torn cartilage in his shoulder and needed surgery.